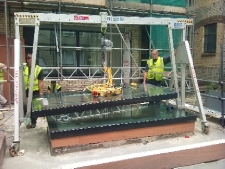 Welcome to Specialist Lifting Solutions we offer a Lift And Shift Service & Solutions for all of your Heavy and Awkward items using a range of Specialist Lifting Equipment we can Lift and Move Items up to 10,000 Kg With Ease. 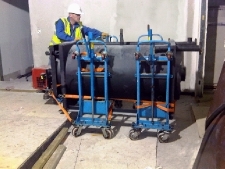 At Specialist Lifting Solutions we offer a specialist lifting service for all of your heavy and awkward items using our specialist lifting equipment we can lift and move items up to 10,000 kg with ease. Site surveys, Task specific risk And method statements, copies of insurance can easily be arranged. We have lifted moved or relocated and installed many different types of equipment such as. air conditioning units (inverter / condensor), switch panels, motors, commercial boilers and pumps, vending machines, commercial & domestic appliances, safes, fireproof cabinets, computers cabinets and data racks, glass panels, works of art, plant and machinery to construction industry equipment. All of the Specialist Lifting Solutions employees are trained to the highest standards and CSCS, Lucas registered. Take away all your health and safety worries, let Specialist Lifting Solutions take the strain with our Lift and Shift powered stair climber service. Whether it's in the home or in the office, we can move heavy items up to 680 kilos up or down stairs, steps with ease; all our employees are fully trained and experienced to handle all stair climbing situations. 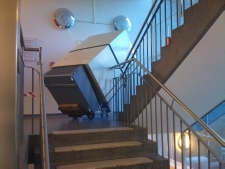 The Laboratory freezer in the picture weighed 500 Kilos and was taken down stairs from the six floor to ground level using our powered stair climber. No matter whether it's glass, steel, or fine art Specialist Lifting Solutions will move it all. All of Specialist Lifting Solutions employees are CSCS registered and working on construction sites are part of our daily routine. So if you need something heavy and awkward lifted or lowered regardless of its weight size or shape Specialist Lifting Solutions lift and shift Service can move it for you. You will find a list Below of items we are regularly lift and move. This is just a small list of items we regularly move Specialist Lifting Solutions Lift and Shift Service have all the experience necessary to lift and move your heavy item whether it's needs to be brought up or down stairs lifted through windows in a domestic home or on a construction site Specialist Lifting Solutions lift and shift service a specialist moving company. Based in Cirencester Gloucestershire we offer a nationwide service and are prepared to travel any distance required. We provide our lifting and shift service in the following locations; Swindon, Cirencester, Stroud, Tetbury, Nailsworth, Malmesbury, Oxford, Cheltenham, Bristol, Chippenham, Hereford, Birmingham, London and Greater London, Cardiff, Worcester, Newbury, Wiltshire, Somerset, Bath, Corsham, Trowbridge, Gloucester, Coventry, Surrey, Wokingham, Solihull, Reading, Guildford, Yate, Devises, Maidenhead, Uxbridge, Fichley, Croydon, Buckinghamshire. Copyright Specialist Lifting Solutions - Lift and Shift 2019©. All Rights Reserved.